Jay Cooke State Park, located about ten miles southwest of Duluth on the St. Louis River, includes 8,938 acres of forested land. The park spans both sides of the river from the western edge of Fond du Lac to the town of Carlton, Minnesota. The focal point of the park is the river, which flows over the ancient bedrock exposing stunning rock formations created by eons of seismic activity and erosion. 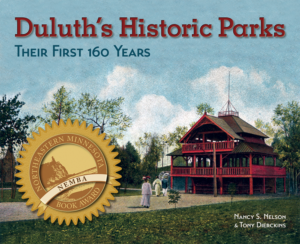 The park takes its name from Philadelphia financier Jay Cooke, whose investments helped spur the development of Duluth in the 1860s. Cooke’s largest investment was financing construction of the Northern Pacific Railroad, which promoters planned to build from Carlton, Minnesota, west to the Pacific Ocean. While visiting the area to see where the railroad would start, Cooke recognized that the surging waters of the St. Louis River’s rapids above Fond du Lac (also called the “dalles”) could produce electricity to power nearby towns. Cooke purchased thousands of acres along the river but did not live long enough to see his vision realized. His land was purchased in 1902 by a group of investors including C. C. Cokefair. They formed the Great Northern Power Company, built a dam near the town of Thomson, and began generating electricity in 1906. In 1915 the company, by this time the St. Louis River Water Power Company, donated to the state 2,350 acres of surplus land along the river. The Minnesota State Legislature passed a bill in the 1915 session creating Jay Cooke State Park and authorizing $15,000 to purchase an additional 4,000 acres. Duluthian F. Rodney Paine was hired as the park’s first manager; in 1926 he became superintendent of Duluth’s park system. 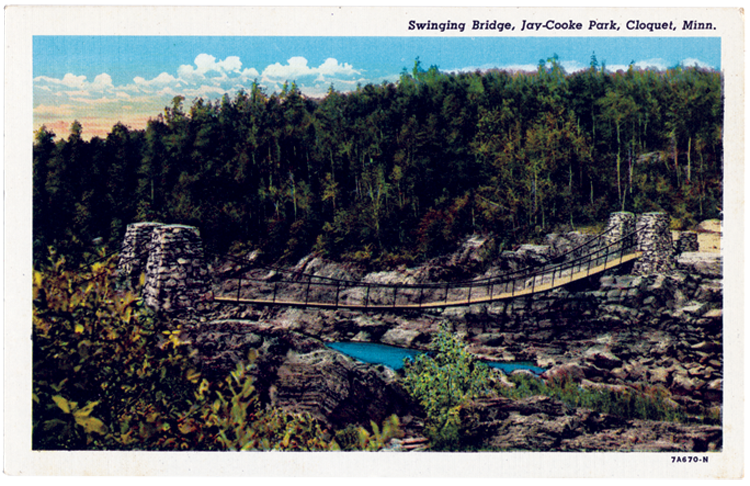 Jay Cooke State Park is best known for its swinging bridge (shown above in a lithographic postcard ca. 1925), first constructed in 1924 by the U.S. Forest Service. The swinging bridge spans a particularly rocky and narrow portion of the river. The bridge’s pylons are made of local stone, and steel cables support the two-hundred-foot span of wood and steel; it is one of just two suspension bridges in all of Minnesota’s state park system. In 1933 the Civilian Conservation Corps (CCC) set up camp in the park while workers constructed picnic sites and completed projects to prevent soil erosion. The following year the CCC rebuilt the park’s famous bridge. The camp closed in 1935 and reopened in 1939, the year the CCC built the park’s River Inn, one of the largest buildings in the state park system and known today as the Oldenburg Interpretive Center. Like the bridge, the inn and its accompanying water tower, latrine, and other structures are all made of logs and stone in the Rustic Style tradition. In 1945 the state purchased another large piece of land for the park and has since added even more property to the site. Five years later, floodwater damaged the deck of the swinging bridge; it took three years to replace the bridge with a new span whose deck rested seven-and-a-half feet higher than that of the previous bridge. The flood of June 2012, largest on record in the park, again destroyed most of the swinging bridge and caused major damage in many areas of the park. A reconstruction of the bridge, designed to replicate the 1934 span, was completed in November 2013. As of 2016, the original 2,350 acres of Jay Cooke State Park have grown to nearly 9,000. More than 300,000 people visit Jay Cooke State Park every year, enjoying fifty miles of hiking trails, thirty-two acres of Nordic ski trails, ten miles of snowshoe trails, and more than eighty campsites—and its iconic bridge once again swings over the St. Louis River. Jay Cooke became the namesake of a Duluth park in 1922 when a statue of Cooke designed by Henry Shrady was placed within an existing triangle at the convergence of Superior Street and London Road. When the triangle was eliminated with the expansion of Interstate 35 through Duluth, Jay Cooke Plaza was created atop a highway tunnel, and the statue now rests there.